>Silence is Golden: A GSA Success Story From New Jersey! Our GSA had an awesome DOS. We didn't just remain silent, club members decided to make t-shirts so that people would know why they were remaining silent. We came up with the slogan, “Silence Isn't Golden.” About 50 t-shirts were made (this was done in the library at lunch time when we are very crowded, with anywhere from 150-200 students, so lots of people saw us working and wanted to know more about the DOS). Then we figured we needed to do something for people who wanted to show support but couldn't stay silent all day for whatever reason. 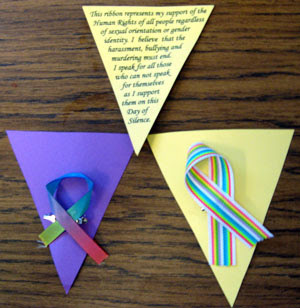 We borrowed an idea from another school and made rainbow ribbons. We made about 500 of these. We put a ribbon in each staff member’s mail slot. I sent an email earlier explaining what the day was about and I also told staff members that if they didn't want a ribbon they could leave it in a box that would be placed in the office for that purpose. The DOS didn't start off well. A staff member came to me in the library to talk to me about "library issues." Well he had several but the main issue was he couldn’t believe that I would be “involved in something as disruptive as the Day of Silence[his words]!” I was sure this was a portent of the future. Sure enough, the next day when I arrived at school I looked in the ribbon return box and it was full. I was disappointed. But after about a half hour, something started to happen. Students started coming to the library looking for the ribbons. Students wanted to know how you got a t-shirt, and what you needed to join in! Teachers started to email and phone me asking for ribbons for their classes. One teacher called me to her room to show how she was using the ribbons as a teaching tool. She spent almost her entire class talking about what the day meant (and she is a math teacher!). But the most gratifying moment came when a teacher I didn't think would be supportive walked into the library proudly wearing a ribbon. I was so sure he wouldn't I told Erica, the president and founder of our GSA, not to put one in his box. Erica refused and said that everyone had to get a ribbon- that they needed to make the choice to return the ribbon, we couldn't make it easy for them not to participate! When I told this teacher that I was surprised he was wearing the ribbon he asked me why I felt that way. I stammered that I thought he was very conservative. He then asked me why being conservative meant that you wouldn't support human rights. 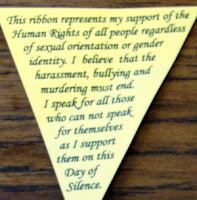 He went on to say the Day of Silence was about human rights and that he was for the rights of all humans! A learning lesson for me! Another teacher that I didn't think would be supportive stopped by to give me two poems he wrote to honor the day! By lunch time every one of our ribbons was gone. We could have distributed at least 100 more! I got so many complimentary emails from staff and the students were so grateful. I think there were many students who felt that this showed that they are safer in our schools because they have many, many allies! We also found out that every single administrator wore a ribbon! >Save the Date: April 17, 2009! 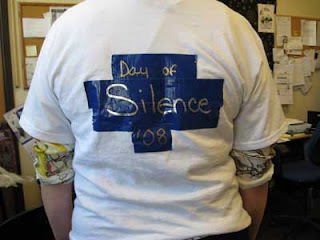 >Students have been asking when next year's Day of Silence will be held. We're happy to announce it will be Friday, April 17, 2009. In deciding on a date we search the vacation and testing schedules of the top 20 largest school districts. We then search national and religious holidays and look at all the results together to find a date that works well for everyone. From this process we determined that April 17th would be best for most students in 2009. So put it in your personal calendars and get it onto your school's schedule too. Remember, it's less than a year until the next Day of Silence! Most recently, GSA spearheaded Edgren’s participation in Friday’s “National Day of Silence,” a movement started at the University of Virginia in 1996 to prevent bullying in schools. This year the event was dedicated to Lawrence King, a California middle school student who was shot and killed in February, allegedly because he was gay. At Edgren the event drew participation beyond the GSA circle, with about 30 students wearing T-shirts and toting white boards or pen and pad to communicate in classrooms and hallways. “Ethnic, religious, sexual differences is no reason to single someone out and treat them differently,” Heather Steele, a senior and National Honors Society member, jotted in a notebook. >Just because the Day of Silence is coming to an end for most students doesn't mean you still can't register, even after the fact. If you haven't registered, please do so here. MINNESOTA: Hello. My Name is J.A. [name edited] and I attend [school district name]. I learned of the Day of Silence from my best friend T. earlier this week. I wanted to take part in it greatly, and we soon got other kids to join: We were all devoted supporters of the LGBT and wanted to show support by committing to stay silent the whole day. This Morning, we did Makeup, painted Rainbows and such on our arms and clothes and went to school. We hung signs up on our lockers to spread the word. However, most of these actions were met with sour remarks, and sometimes, Violence. The signs on our lockers were torn off and shredded on the ground before them: We were being harassed by many, sometimes, Even some of our best friends. We were met with statements such as "Oh my god...I see Faggots." or "Why do you support the Fags." and sometimes worse. One of my best friends was told "Just be like your father and kill yourself; then you can be silent forever." We spent the whole bus ride home comforting her. I am sickened that people in our school used our beliefs as an excuse to make fun of us. I honestly hope that It wont take them long to realize that what they did, is exactly what we are standing against. We were Harassed, and we were silent. We were met with disheartening actions, but we remained silent. I am proud that I have taken part in this protest, and im positive that all 18 of my other friends were too. >Pam's House Blend has made the DOS blog her "pick of the week". Yay! And of course, she's covering the anti-Day of Silence protest that happened this morning out in Washington State. Hey Pam, thanks for the links. Here's one back at ya'! We are all amazed at the nationwide (and beyond!) support friends and allies have been demonstrating all day and all week. Thank you so much for your energy. Together we can make 2008 the most bullying-free year on record. I am a student at [school name] High School in [city] Wisconsin. Just a freshman trying to get through my first year of high school, which is really hard when you show you support gay pride everyday. There was no school today, so instead of my school doing it today on the specified day, we did it on Wed., our last day of school for this week. Multiple students and I are participating today as well. There were no stickers or shirts or anything like that. It was just the speaking cards that our library had let us copy in school and the message written on our hands. We were silent the whole day, and at some point our vice principal told us we weren't allowed to because we are a protestant school and don't believe in homosexuality. But we didn't stop. All of us kept on going throughout the whole day. We showed the cards to our teachers, handed them out at school. The response was amazing. There are about 750 Kids in our school. All of us together got at least 150 to take part, mostly freshmen and sophomores. The teachers were very understanding, and proud that we were sticking up for something that we believed in. One of my close friends, who just got outed that he was bisexual, Wore as many gay pride items that he could. I made necklaces for my group, we got rainbow ribbon and wore it all day. The respose in our little protestant school where they teach that being a homosexual is wrong was amazing. There were a lot of people that thought we were crazy, but we kept on going. I got one of the most anti homosexual kids in my school to take part after explaining this all. In turn that got many more to help out. At the end of the day, everyone was smiling, communicating between notebooks if it was vital and everything else. I have never been more proud of my school. Everyone who had participated had found something rainbow to wear, or had asked someone to draw a rainbow on them. There were a lot of tears to share that day. I had a piece of paper on my shirt that had a list of all of the people my group knew that had die of hate crimes, and everyone felt it. One of which was one of my best friends that died not to long before this for being openly gay. It was an amazing day, and everyone understood. Thank you for uniting a school. Thank you for helping people understand. I am now the freshman who made a difference. Hi All, Here at [school name, city], the reply to our Day of Silence just floored me. Such a positive reaction. We have about 2700 students, and I gave out over a thousand stickers...and the teachers...wow!...so many teachers supported us by wearing "Vocal Supporter" stickers. The silence was deafening throughout school. I made an announcement yesterday and today, and will close with one today. I feel like a proud father, and the kids are walking around so proudly as well! ...and we will also have a 'break the silence' snack at the end of school before the go home! Hope it went as well across the country as it did here. Our administration couldn't have been better. Greetings Allies: At my school in rural New Brunswick, Canada, we had about 50 kids take part in a silent march through the school. 30 of them we silent for the whole day. We had a screen set up in the cafeteria area and ran power point clips of Lawrence King all lunch hour, especially the one with the R.E.M. track. Powerful. One student, who has just come out, stood with a poster near our display. Such courage. As I watched him, I noticed a tear roll down his face. I went over and said, "Joy? Relief? " Then a number of kids came up and hugged him and we had a group cry. So, so affirming. Thanks for holding this event. Things like this touch lives.